Create the individual room structure. Add windows, doors, and connections. Have your bathroom design sent. Let your local dealer help you. Use our pre-defined standard room shapes to create a basic floor plan with the dimensions of your bathroom. If your bathroom doesn’t correspond to any of the default standard shapes, you can use “FREE-FORM ROOM” to create a room from scratch with your dimensions. To take ceiling slopes into account in your bathroom design, click on the ceiling symbol inside the walls that are affected. To make your plan reflect the actual conditions in your bathroom, add the existing windows and doors and electrical/water connections in the second step. The 3D bathroom planner will take these into account as you continue designing your bathroom so that when you implement it, there are no surprises. Use Villeroy & Boch’s unique collections to find and select products you like and place them in the desired spot on your floor plan. If structural conditions make it impossible to place something, the bathroom planner immediately warn you. Thanks to the variety of views and perspectives, it's easy to coordinate individual products exactly and then view the design in 3D. After you have successfully finished designing your bathroom, you may have your design and all of the product information you need as well as additional design options sent to you as a PDF. Just enter your first name, last name and email address in the boxes shown for this and within a short time, you’ll have all the information you need for realizing your dream bathroom. To find the closest dealers, just enter your telephone number in the proper box. A list will appear and you can select the dealer you wish. Once selected, the dealer will be notified and will contact you and assist you with the detailed planning of your bathroom. A tastefully planned bathroom is like a personal oasis of well-being in your own home - a place to retreat, to relax and to regenerate. Enjoy this added quality of living under your own roof, whether as a new construction or a renovation project. 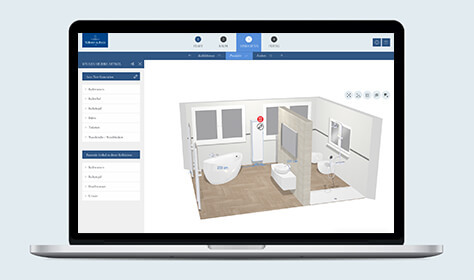 Design your dream bathroom with the online bathroom planner and then create a virtual view in just a few steps. Would you like to work with one of our authorized dealers in planning your very own personal dream bathroom? 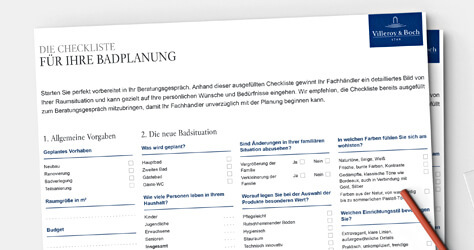 Before consulting with a dealer, we recommend that you prepare by filling out our checklist with the most important information about your room and what your individual wishes and expectations are. 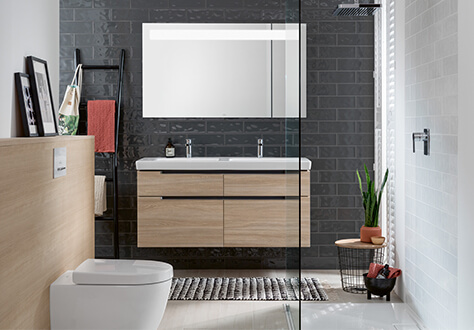 At the same time, each item offers an opportunity to reflect on the criteria that are most important to you in designing your new bathroom. You want your new dream bathroom to be both attractive and functional. 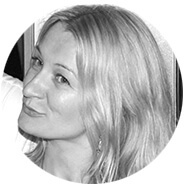 Before you design it, you should consider a few essential points and clarify some basic conditions. Every bathroom has special architectural features that are important to the actual planning of the room. If the water and drain lines are already in place, the location of the sink, bathtub and shower can usually only be changed to a limited degree. 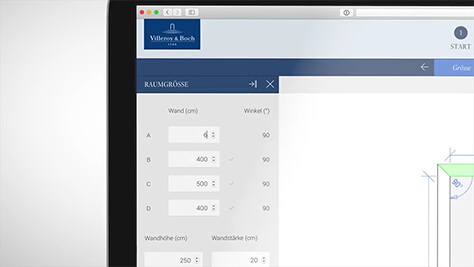 Consult with your Villeroy & Boch specialist to clarify how many connections you need and what expansion work is necessary when you do your planning. Sloped ceilings also have certain restrictions that can have a significant influence on the design of your bathroom. 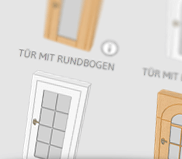 When remodelling, you should also check that the products you select can fit through the existing door. A spattering shower, quietly gurgling bathwater, or a flushing toilet - noises can’t be avoided in the bathroom. To keep them as down for the adjacent rooms, a well-planned placement of the individual components in a bathroom is recommended. A sanitary object directly on a wall shared with another room should be avoided. Install showers and toilets on outside walls to minimize the transmission of sounds. Be sure to included sufficient ventilation for your bathroom in your planning. For rooms with no windows, a ventilation system is an advantage to remove moisture and odors. You want to feel completely comfortable in your personal dream bathroom, which means you’ll need sufficient free space for moving around. It is especially important to not overfill the space if your bathroom is a small one. The ideal minimum spacing between sanitary objects is 120 x 120 cm. You also need to plan enough space for splash water if you want to install a walk-in shower without a door. 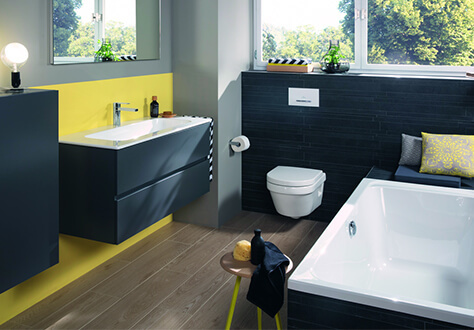 Half-walls are becoming increasingly popular for giving the toilet area visual separation. Be sure to plan more space for this. What do I want to have in my bathroom? Your very own small oasis of wellness should match your needs and desires as much as possible. Think about which items are essential for you during your planning. Do you want a bathtub and a shower, or is one of the two enough? Should there be a bidet or a urinal next to the toilet? Which electrical appliances do you want to use in your bathroom? If you need to have a washing machine and drier in your bathroom, make sure that there are enough electrical outlets in addition to the water connections. Sufficient electrical power also plays a role in creating a pleasant lighting concept for your bathroom. You want your dream bathroom to be a masterpiece of stylish design and practical features. To help you, we have put together the following tips and tricks for you to consider during your design and planning. Family bathrooms have other requirements than guest bathrooms. Think about how many people will be using the bathroom now and in the future. Double sinks are the perfect solution when two family members need to brush their teeth at the same time. If you have children, easy to clean materials are an advantage. Tiles are much easier and faster to clean than a wall covering of wood or wallpaper. Villeroy & Boch CeramicPlus finishing also makes cleaning the ceramic surfaces easier. And don’t forget to consider how much storage room you will need when selecting your bathroom furniture. 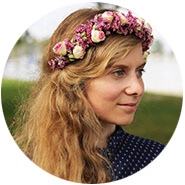 Do you want to plan a barrier-free bathroom? Barrier-free is also a relevant topic when remodeling your bathroom. There needs to be enough space available in order to have all relevant objects easily accessible for comparable comfort. Entry doors without thresholds as well as an accessible shower are essential parts of a barrier-free bathroom. Even the individual height and additional functionalities of the different bathroom elements should be considered. Additional products, such as a grab bar in the bathtub or a shower seat, can meet the corresponding precautions. Remodeling your bathroom offers you the opportunity to have a completely new style. Before you start planning, think about which design harmonizes with your ideas and desires best. Do you want something timeless and classic? Or extravagant and luxurious? Do you like country living style, or metropolitan style? Do you like clean lines or do you prefer curved shapes? 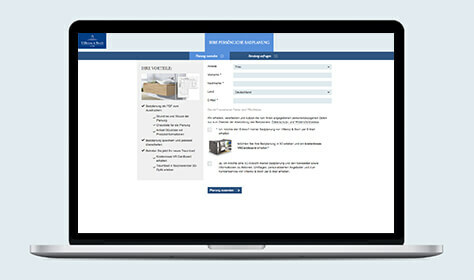 Our inspiration website pages can give you ideas, and you can try out the different components in your room profile using our online Bathroom Planner. When selecting furnishing objects, you need to pay attention to the practicality of the individual furnishing elements as well as the design. You should have enough cupboards, counter space and shelves to be able to neatly store all of your personal care products. If you have very little space, a tall cupboard and under-sink cupboard are excellent choices. Practical furnishing pieces can prove to be real storage wonders and take up little space themselves. Sufficiently large sinks also offer welcome comfort and convenience in daily use. To effectively light your dream bathroom, use a combination of different light sources. For example, use an adjustable recessed light to achieve a basic level of light, and, at the same time, to spotlight individual objects. Mirror lighting gives you the brightness you need for your daily personal care and pampering routine. When selecting lighting, you should also consider the different effects of cold versus warm light. Colored light can have an effect on mood. For example, blue is relaxing, while orange light gives off a pleasant feeling of warmth. Be inspired by our bathroom ideas and create your very own personal oasis of wellbeing. Discover the variety of colors, shapes, materials and accessories. The Subway 2.0 collection has an energizing purism and huge selection of models. With clearly defined design language and precise lines, the individual products radiate incomparable harmony. Experience the most luxurious expression of aesthetics with the Finion collection. The puristic design idea and the precisely worked materials flow together into high-quality products that radiated personality and promise the highest quality of life. The Architectura system collection meets the highest standards of design and comfort. The rimless, ultra flat shower trays are particularly impressive - perfect for contemporary, timeless bathroom furnishings. First-class design and well-thought out functionality meet in the perfect symbiosis in Venticello. 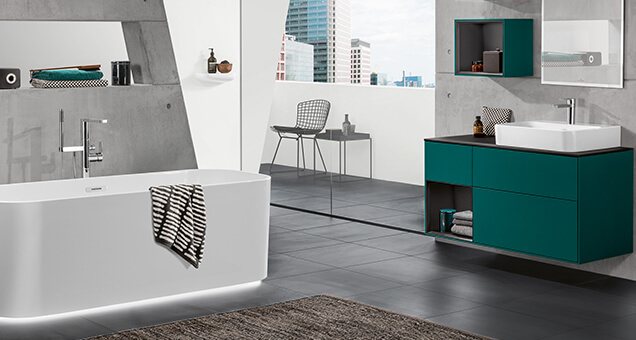 Both the ceramic products and bathroom furniture have a weightless beauty that still manage to be very practical and useful. 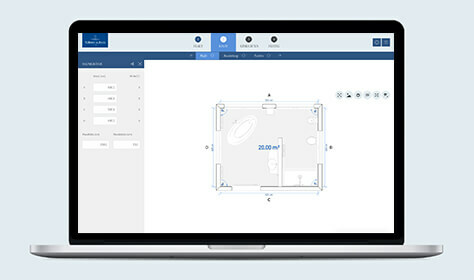 How do I create an individually shaped room in the online bathroom planner? First, select “Start” in the “Free-form room” under Room Shapes for an individual room shape. A grid will appear. Draw the shape of your room here: Click on the starting point and drag and drop the line in the desired direction. As soon as you release the line, the wall is created. Repeat this until you are back at the starting point. How do I adjust the size of the bathroom in the bathroom planner? You can adjust the size of the bathroom in the second step “Room” under “Size.” You can see a floor plan of your bathroom here. 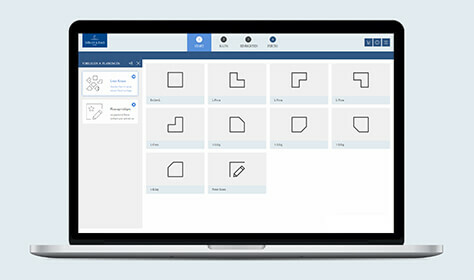 You can now select individual walls and move them using drag & drop. 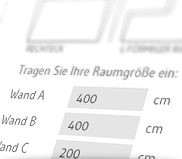 Or, you can enter the exact length of the individual walls and the wall height and thickness in the menu on the left instead. The size of the bathroom can also be adjusted after you have placed items in the room - they will stay even when the room size is changed. How do I add spatial elements, like windows and doors, in my bathroom? 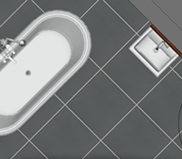 Room elements can be added to your bathroom in the second step "Room" under "Facilities.” To do this, click on a category in the left menu and select a room element: Use drag&drop to move the element to the desired spot in your bathroom. 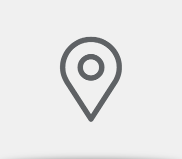 You can also drag and drop an already placed element at any time. How do I add a partial wall in my bathroom? After you have defined the room shape, you can add various partial walls to your bathroom in the second step “Room” under “Features”. Click on “Walls” in the left menu and select one of the partial walls. Use drag&drop to place it on an already existing wall in your bathroom. Once you have placed a partial wall, you can select and move it at any time. How do I change the color/tiles of the floor or the walls in my bathroom? Floors and walls, as well as other room elements in your bathroom, can be designed with various colors and tiles. Select the room element you want to color in the left menu under “Colors” in the second step “Room”. Or, you can simply select the element in the room. Then, click on the color you want in the pre-defined colors or Villeroy & Boch tiles. How can I save my bathroom planning and continue at a later time? You can save your bathroom design at any time and then come back and work on it by clicking on “Finish planning” in the fourth step “Finish”. 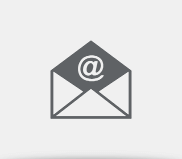 After completing the contact form, you will receive a link to your individual planning and a PDF with the floorplan, a 3-D view and an itemized product list. Your design is now permanently saved and you can open and edit it at any time. 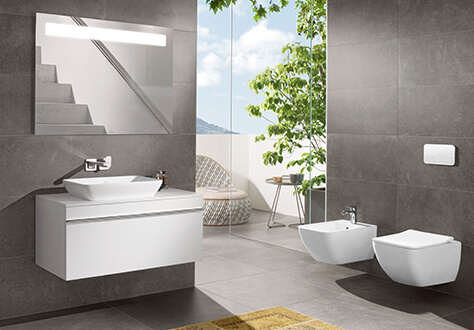 Villeroy & Boch stands for a perfect combination of functionality, comfort and design. 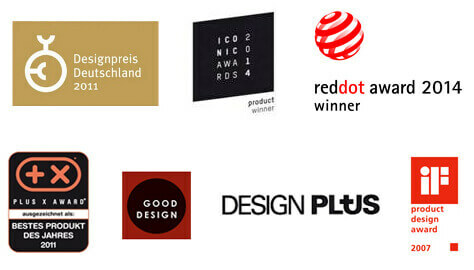 Many Villeroy & Boch collections and products have been awarded design prizes.